Yes, these are the things I think about as I wend my way gingerly through the raspberry thicket, cradling soft red berries in my hands and contemplating the nature of fate. You can see what my parents were up against. But really, the point here is that the amount of raspberries we’ve had around our house lately is directly proportional to the pleasure I take in picking them. Which is to say there’s been a lot of raspberries. 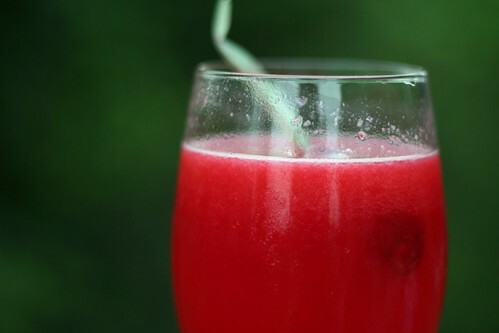 A particularly easy and particularly nice way to enjoy an abundance of raspberries — particularly on a hot Sunday afternoon — is with gin. And champagne. Need I go on? I mean, there’s raspberries and gin and champagne. What more do you need to know, aside from proportions? Oh, fine. The raspberries get muddled with a bit of sage and a splash of sweetened lemon juice to create a lovely fusion of tangy sweet earthiness which is then combined with the crispness of gin and the effervescence of champagne. It’s wonderful. And dangerous. And ridiculously pink. But mostly wonderful. 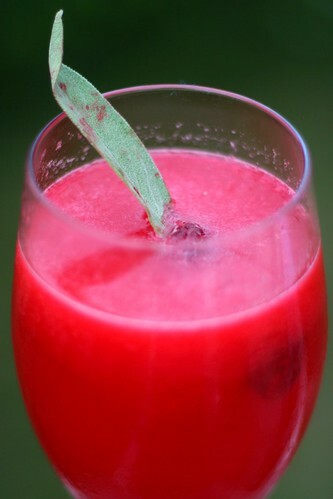 In a mixing glass (a Mason jar works just fine) muddle sage leaves, raspberries, lemon juice, and simple syrup. Add gin and a few ice cubes and shake well. Add a splash of champagne and rock gently to combine. Strain into glass to serve. If, for some reason, you decide to serve this in a ridiculously large 16 oz. glass, you’ll have to make, like, three of these to fill one glass. You’ll also have to cancel everything else on your schedule for the rest of the day because we’re talking three shots of gin and at least a glass of champagne. I suspect this would also be nice with mint instead of sage, especially if you’re not into sage. This entry was posted on August 18, 2009 by Megan @ When Harry Met Salad. It was filed under cocktails and was tagged with cocktail, raspberries, raspberry french 75, summer. Pink and green again?! Seriously, I knew things were going to get bad once I left. . .
P.S. That cocktail book have any drinks using huckleberries? Katie – Maybe you better come back. And no, no huckleberries. But you need it anyway. Lu – Are there raspberries in Bangladesh? If not, you could substitute extra gin. Karine – Thank YOU for visiting! 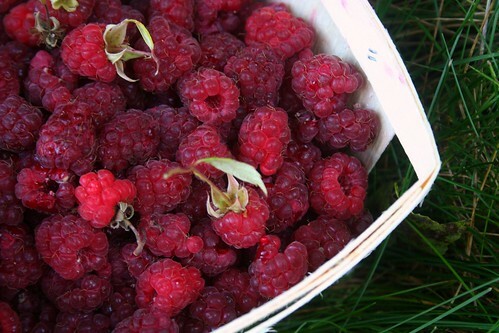 Wish I still had some raspberries. Maybe next summer. We used to pick berries and lots of other fruit when we lived east. I’ll always miss that. I agree with you, working outside like that is good for the soul. It feels so good, and the sounds of the birds and the fun of finding a great big berry in very, very back… Well, I just like it. The drink looks wonderful, too. I was thinking of you and your photography when I was mixing up a Prickly Pear Margarita the other day. The pick color is so pretty. I’ll have to post a picture. I can buy frozen ones, but not fresh. I bet it would work with frozen though, at least if I add extra gin. I love picking raspberries and weeding too! Perhaps if I knew hippie colleges existed I would have tried to go to one too, though I’ve actually more of a left-winger now than I was at 17 so maybe those hippies would have freaked me out then. Anyway, all this to say that I really enjoy your blog. I stumbled upon it (on my own, not through that website) when I was looking for a recipe for lavender cookies and I’ve been poking around through all of your past posts. I just wanted to let you know that I like your style, and your recipes, and I hope you keep writing more for us!